Cardiff defender Steven Caulker has said he is optimistic that good performances for his club can earn him a recall to the England squad. The 21-year-old has been capped once by England, scoring on his debut against Sweden in November 2012. 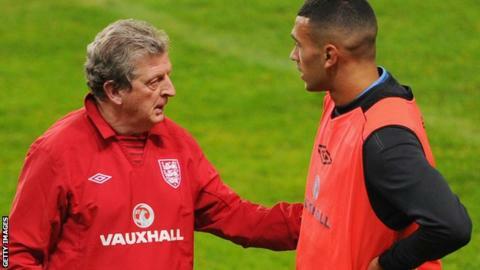 But he has not featured since and is not in Roy Hodgson's squad for the friendlies against Chile and Germany. "I would have loved to get the call, but I can rest and look to build on the performances for Cardiff," he said. Caulker's, whose only cap came during his time at Tottenham, continued: "You've always got to continue to believe in yourself. If you play well then you never know - the call might come." Caulker left Spurs for Cardiff in July 2013 for a fee in excess of £8m and has scored twice for the Bluebirds this season. One of those goals was the winner against another of his former clubs Swansea in the south Wales derby on 3 November. But Cardiff were brought back down to earth on Saturday when Leandro Bacuna's spectacular free-kick and Libor Kozak's header gave Aston Villa a 2-0 win. "I thought we played well and I thought we deserved something out of the game," Caulker added. "We felt comfortable and felt in control and couldn't really see where they were going to get a goal. "When the free-kick went in they came on strong for the last 15 minutes and managed to get a second. "But I think there's a lot of positives still to take." Cardiff resume their Premier League campaign after the international break with back-to-back home games against Manchester United and leaders Arsenal.